Election to the National Academy of Sciences is one of the highest honors for a scientist. In the latest induction, only 9 of 72 new members were women. As women make up more of the Ph.D. recipients in the sciences, their representation in prestigious awards should also go up. The Association for Women in Science has depicted a different trend. 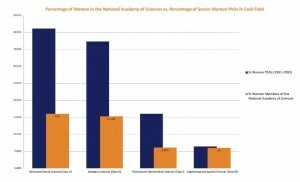 As this graph shows, the NAS is not keeping pace with the proportion of women scientists. It’s hopeful that women in engineering and applied sciences have reached parity, but gaps still exist in other fields. Part of the cause may be that only Academy members can nominate new members, thereby perpetuating a male dominance. Making the club more open might increase the diversity of its membership. This entry was posted on Monday, May 16th, 2011 at 9:25 am	and is filed under Faculty development. You can follow any responses to this entry through the RSS 2.0 feed. Both comments and pings are currently closed. Ask not what your country can do for you ask what you can do for your country. If you want to be successful find someone who has achieved the results you want and copy what they do and you’ll achieve the same results. Actually one of the challenges which people beginning a brand new on-line company face is that of acquiring visitors to their web site. Wow. This blog is amazing. How do you make it look this good . I have been reading out a few of your posts and i can state pretty clever stuff. I will make sure to bookmark your blog. I just came to your internet site last week and I have been checking it out often. You have a lot of excellent information here and i also love the actual design of the website also. Keep up the great work! Your blog on phone does not look so good like on PC. Please, correct it! Hello There. I found your blog using msn. This is a very well written article. I’ll make sure to bookmark it and return to read more of your useful info. Thanks for the post. I will definitely comeback. Of course, what a splendid site and illuminating posts, I will bookmark your blog.Best Regards!